This bears repeating: The Good Place is not a Christian show. It ducked away from endorsing any particular theology in its very first episode, when Michael explains Doug Forcett, a stoner, is the guy who “got it right” (well, 92 percent of it) in regards to the afterlife. The show operates on a melting pot thesis statement of what comes next, and not to its detriment, because rather than being a show about truth, The Good Place is about the search for truth, and what that search means for people who are just trying to figure out how to live life well. Smart people call this exploration “meta-ethics,” but for most of us, it means The Good Place is just really darn fun. The show’s lack of adherence to any one creed means it can dabble in a bit of everything, making for a series that moves between ideas faster than a college freshman in the religious section of an activities fair. The Good Place has dealt with utilitarianism, contractualism, nihilism, moral particularism, moral intuitionism, virtue ethics and loads more philosophies, channeling thinkers as rangey as Plato, Kant and Judith Thompson. This intense syllabus was all in service of answering the question “what do we owe each other?” which served to push the characters down a path toward the Good Place itself (with any luck, for them and the viewer). Until the most recent episodes, including last week’s “The Book of Dougs,” The Good Place structured judgment in its afterlife model around a points system: Good actions earned you points and bad actions took away points, and if you reached a certain point threshold, you entered the Good Place. Salvation by works, basically. But as the characters wrestled with the points system to earn their way to heaven, they found that defining actions as good or evil was almost impossible because things like motivation and context muddled so much of what they did and why they did it. In season three, their frustration reached a boiling point after the revelation that no one had made The Good Place in 500 years; the point threshold was just too high. Good Place employees are very trusting. The gang fibs their way into the post office by saying they were chased by demons and Dracula with a bazooka, and Gwendolyn, the smiley postal worker, buy their story. Related: Good Place postal workers have badges that carry pictures of unicorns. Humans can only enter the Good Place through the main entrance, which is 500 trillion miles “north south north” of the correspondence center/post office. If you try to break into the Good Place by picking a lock, whatever you stick in the door just turns into glitter. Phones in the Good Place don’t have numbers. You just pick up and they connect you to whomever you want to speak with, which feels like something we could have in real life. Paul Scheer is in The Good Place. 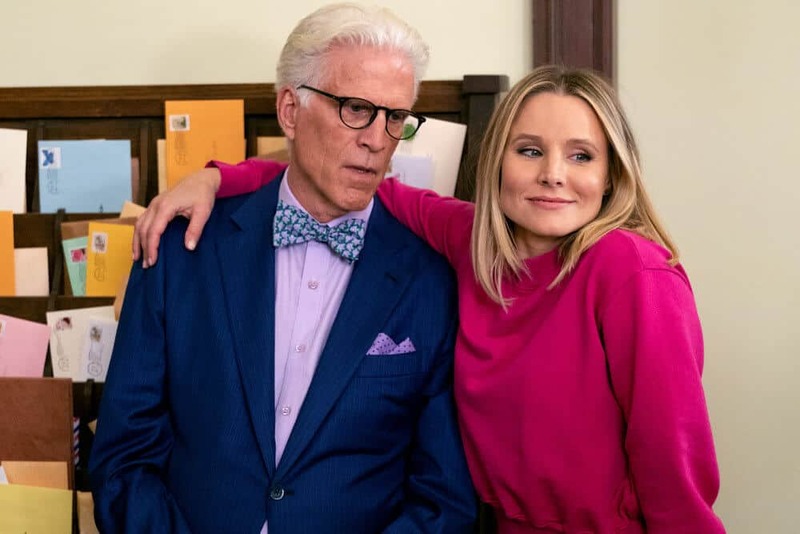 The Good Place operates on a very strict bureaucratic system in which review of its processes take millennia, so for the gang to be considered via traditional means, they would have to wait thousands of years for a decision. This presents the main bug of the Good Place as The Good Place presents it. All of The Good Place’s meta-ethics have brought it to the point where its at odds with the works-based system it has used so far, and because that system is starting to inhibit the characters, we’re seeing an active discussion of grace appear on a show that until now has kept things pretty legalistic. There’s no Jesus talk (yet? ), but the idea is unmistakable: Eleanor, Chidi, Tahani and Jason (and Michael!) are good people trying to do the best they can, so why can’t they just be forgiven and enter the Good Place? That’s the show from here, and it presents an exciting turn as we near the third season’s finale this week. The Good Place will never be a religious show, but it’s always been a philosophical one. In season three, it’s become just a bit spiritual, too. Perhaps what we owe to each other is beyond what we have the right to give.